Make this your secret getaway in the mountains! Perched on a hillside bluff, this tin-roofed cabin offers stunning views of Phoenix Mountain, a spacious and roomy layout and most importantly, privacy. The main level of this home features an open living floor plan with kitchen, dining, living room combo and wood floors throughout. Living room features wood burning stove (firewood provided) and TV with Netflix and DVD player. Kitchen comes equipped with refrigerator, electric stove, microwave, dish washer, toaster, coffee maker and plenty of counter space. Dining seating for 6. Also located on the main level are two bedrooms, one with queen size bed and the other offers a full size bed. Both share a full bath with claw foot tub / shower combo. The master suite is located in the loft and features a queen size bed with small private bathroom, single shower only. 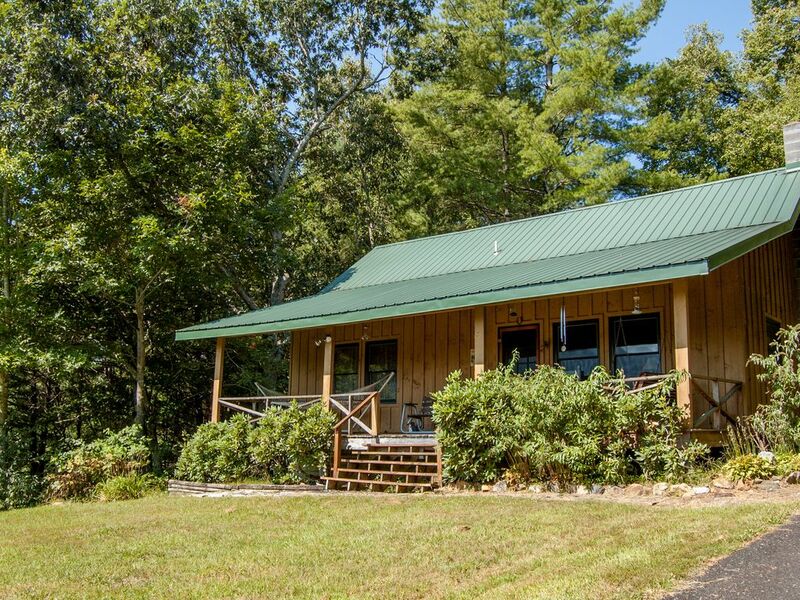 Outside, you’ll enjoy the breathtaking views from covered porch with rocking chairs and porch swing. Or enjoy the back yard and deck space equipped with gas grill, outdooring dining space and corn hole! We found this property available for a last-minute trip to the mountains, at a very reasonable rate. The cabin was clean, spacious, and was perfect for our long weekend. The wood burning stove worked great, and we even used the little gas grill outside. The beds were comfortable and we loved the porch furniture. The shower situation was a little challenging, but the water was warm. The driveway is steep, and we were concerned about the bad weather one we just didn't leave the house. Our family would definitely stay here again! This cabin is tucked away and yet very accessible. It is equipped with every small detail. Very simple but incredibly confortable! Great front porch! I had looked at several but this one seemed to be right for us. Need to get away after Florence and my sister needed a few days away because she had lost her home to the flood. Was very happy with the cabin. Quiet and private and the view of the mountains while you sat in the porch swing was truly a sight to see. We were all very pleased with this property. We loved the house. Super cute. Beds were comfortable. Regular sheets would have been better given the weather. Flannel sheets were a little warm. We did have SEVERAL bees and wasps that we had to kill inside. I know cabins can be prone to inside bugs but it seemed like a lot. Beautiful area and a short drive to West Jefferson and Grayson Highlands. Pizza place in town was worth the wait! The cabin was extremely clean, spacious, private, and had breathtaking mountain views. I would highly recommend this rental and plan to stay there again! Our time at the cabin was wonderful. We were able to enjoy our stay and sleep well. The only concern we had was that the loft was very hot and had little privacy and the rooms below were very cold but other than that it was a lovely stay and we hope to go again soon.